Arsenal vs. Chelsea : 24 January 2016. I began the day early. This was going to be a long one. I had everything planned out. As with last season’s trip to Arsenal, there would hopefully be a little pub crawl for the four of us from the Somerset and Wiltshire border, ahead of meeting up with more friends nearer kick-off. This would be my tenth trip to Arsenal’s new stadium. For the vast majority of those games, and a couple at Highbury too, the meet would be at “The Shakespeare’s Head” at Holborn. Last season, after Parky and I went on an enjoyable walk on the north bank of the Thames in Chiswick and Hammersmith, we arrived late, just as the pub was reaching a Magic Hat crescendo. This year, we would be aiming for a walk through the West End before joining the massed ranks of the Chelsea Loyalists. It was going to be a fine day out. The actual football itself worried me of course. I am sure that I wasn’t alone with those thoughts. As I set off at just before 8am, I turned the car radio on. I was automatically tuned to Radio Two, and a Sunday morning show was playing a musical version of “The Lord’s Prayer.” On a day when I might be seeking for divine intervention in the quest for goals and points, I thought that this was quite apt. The Chuckle Bus was fully laden for the trip to the capital. PD and myself in the front. Glenn and Parky in the back. When I had picked up PD, we both agreed on one thing. Whisper it, but I was almost expecting us to get gubbed. Glenn, who was coming with me to Arsenal for the first time since those two back-to-back FA Cup games in 2003 and 2004, was much more upbeat. The roads were quiet. We parked at Barons Court and rode the dark blue Piccadilly Line in to the West End. The pubs were relatively quiet, but it made a nice change to be seeing a different part of the city. Our ramble took us slowly east. We were able to relax and enjoy each other’s company. Football was only part of the equation. Each of the first four pubs were cosy and full of character. “The Round Table” is a particular favourite of mine, its reputation slightly tarnished only because it brought back memories of Tottenham away last year, when we assembled there prior to heading north to N17. We stumbled across a few familiar faces in “The Sun” – off the beaten track really, quite a surprise – and then headed off to the last pub of the day, which – unlike the others – is far from cosy. Outside, my work colleague Bruno was waiting for me. It was just a minute or so before 2pm. Bruno is from Fortaleza in northern Brazil and had been working alongside me in our office in Chippenham and then Melksham since late Spring. He, typically, is a devoted football enthusiast. While studying in Portugal, he played for a lower level football team, somewhere in the Portuguese footballing pyramid, and his eighteen year old brother is currently on trial with us here in England. His team back home in Brazil is Palmeiras, from San Paolo, the city which hosts our 2012 World Club Championship opponents Corinthians. I was tickled to hear that Bruno has nothing but bad things to say about Corinthians. I heard a whisper that he had a slight inkling towards Arsenal, but I think it is fair to say that since we have been sharing the same office, my devotion to the Chelsea cause has inevitably worked a little magic on him. Throughout the week, I had semi-seriously joked that his life would change on Sunday 24 January 2016. Bruno studied for his Master’s degree at Bath University – he has loved being in England – but was yet to see a football match of any description while over here. Luckily, a ticket became available at the very last minute from a good mate, and so I was very happy to be able to invite him along. The timing really was perfect. His last day of work with us was on the preceding Friday and his flight back to Brazil would be on the Thursday. His wife had left for Brazil a week or so ago. This really would be a royal blue send off. There was just the worry about sending him away from Arsenal with a fine Chelsea performance. I knew that he would enjoy the experience of being in and among three thousand of us, but the actual match result was not so clear. Regardless, I soon introduced Bruno to a smattering of my match-going companions in the large and noisy pub. Very soon, the boozer was reverberating with a few Chelsea songs. I could see that Bruno was impressed. We were stood next to Alan and Gary. I casually mentioned that Gary has missed just one home game since 1976…”Sheffield United at home, 1992, Jason Cundy scored, we lost 2-1, chicken pox”…and this blew Bruno away. As always, Arsenal away brings back memories of 1984. I spoke to Bruno about that momentous day, and showed him a YouTube clip of Kerry scoring in front of a packed Clock End. By the end of our hour or so in the pub, Bruno was asking about membership and season tickets. I had a little chuckle to myself. Courtois – Ivanovic, Terry, Zouma, Azpilicueta – Matic, Mikel – Oscar, Fabregas, Willian – Diego Costa. Inside the tube, full of Chelsea, there were songs, one after the other. Bruno was full of smiles. On the walk from Arsenal tube station – I was a little dismayed that I didn’t have enough time to show Bruno the classic art deco stands of Highbury – there were a few more Chelsea songs, but these soon petered out as we got closer to the towering stadium. There was that odd little Arsenal chant as we walked up and over the railway lines. Away in the distance, an altercation between rival fans, an echo from the past. A shove, a punch, a stand-off, a kick. There was time for one last photograph of Bruno and myself outside the Clock End, and we were inside. We only reached our allotted seats with a few seconds to spare. As usual, I was positioned midway back, firmly behind the corner flag, alongside the usual suspects. Glenn was in the front row. PD was further back. Bruno towards the rear. The sky was full of low cloud. The air was still and mild. This seemed like a typical footballing day in the capital. A grey day on the surface, but full of colour – red, white, blue – underneath. The undulating upper tier of Arsenal’s stadium matched my thoughts of the day thus far. There had been lovely highs in the five pubs with good friends, but now my thoughts were full of worry about the ensuing ninety minutes. Our play from the offset looked calm and assured. I was quickly impressed. There was efficiency in our movement and passing. This was as good a start as I could ever have hoped. I am not sure if the mind plays tricks, due to the fact that the stands are so far from the pitch at The Emirates, but there always seems to be tons of space down our right at Arsenal’s new stadium. Ivanovic and Willian were soon exploiting it. Chances were traded, but there were no real threats on either goal. While I waited to hear any noise from the home support, our corner quadrant was full of noise. Of course, I lament the atmosphere in the home areas of Stamford Bridge on virtually a weekly basis, so I can’t be hypocritical and say too much. However, the silence at The Emirates shocked me. Yes, home areas are usually quiet at most stadia these days, but Arsenal seem to continually set the bar high – or low – and it gets worse with every passing season. A fine move found Willian inside the box, but his volley was wildly off target. However, it hit an Arsenal defender, allowing him a second bite of the cherry. Petr Cech – I’m over him, by the way – easily blocked Willian’s snatched follow-up. Soon after, Willian played the ball in to space, dissecting the Arsenal line, and Mertesacker felled Diego Costa. There was a slight delay, but in my mind I was hoping that the much-maligned Mark Clattenburg would show a red card. He didn’t let me down. Get in. The Chelsea contingent roared. This was going too well. Bizarrely, Wenger took off Giroud. A few minutes later, the ball ricocheted out to Ivanovic, lurking in space on the right. He wasted no time in punching the ball low in to the box, and I had a perfect view as Diego Costa met the ball perfectly. The ball crashed in to the net, past Cech, 1-0 to the champions. The south-eastern section of the Clock End erupted. I punched the air continually. Such joy. Arsenal never really threatened us in the rest of the first-half. Our defenders were supremely solid, no more so than the captain, who was simply dominant. We had a few chances. A towering header from Ivanovic was headed off the line. This was fantastic stuff. Our section was in full voice, almost embarrassingly so. Elsewhere, the residents of the Emirates – middle-class, middle-of-the-road, middling – were deadly silent. Arsenal’s best chance of the half fell to Flamini – I struggled to acknowledge that he was still playing for them – but his flick was well over. Arsenal appeared to be missing a cutting edge, as always. I briefly met up with Bruno at the break. The second-half was a different affair. There was less noise from the away fans as the game carried on. I think the nerves were increasing as the minutes passed by. Soon in to the second period, Fabregas, who was enjoying his best game for ages, danced in to the box. He was upended, and bounced into the air. I felt that Fabregas overdid it. Wenger brought on Alexis Sanchez. Chances were still at a premium. Courtois was hardly troubled. Mikel was enjoying another masterclass in controlled containment, and alongside him Matic was playing better than usual. Only his distribution let him down at times. Diego Costa, the Arsenal irritant, was replaced by Loic Remy. We watched the clock on the far side. Inside, I was surprisingly confident that we would hold on. Eden Hazard replaced the excellent Oscar. In the last part of the game, the defenders seemed tired and dropped further and further back. Our sporadic breaks up field soon ran out of steam. Remy’s touch had deserted him; he was poor. An almighty scramble followed as Thibaut dropped a cross at the feet of several Arsenal players. The ball was frantically hacked away. A couple of half-chances for Arsenal were blocked. Courtois, at last, had a real save to make, falling to his left to save from Monreal. At the other end, Willian broke free but scuffed his low shot wide. We all met up after the game. Bruno, the boy from Fortaleza, had bloody loved it. The mood was buoyant. Glenn, especially, was full of smiles. The Arsenal support was obviously glum as they headed back to Middle Earth. The seven of us headed back to civilisation. On the tube, our faces were full of smiles. The red and white scarfed Gooners had their heads buried in their programmes. Their misery was our joy. Ten visits to the Emirates in the League with Chelsea, and our record is excellent. I wished Bruno well as we alighted at Kings Cross. 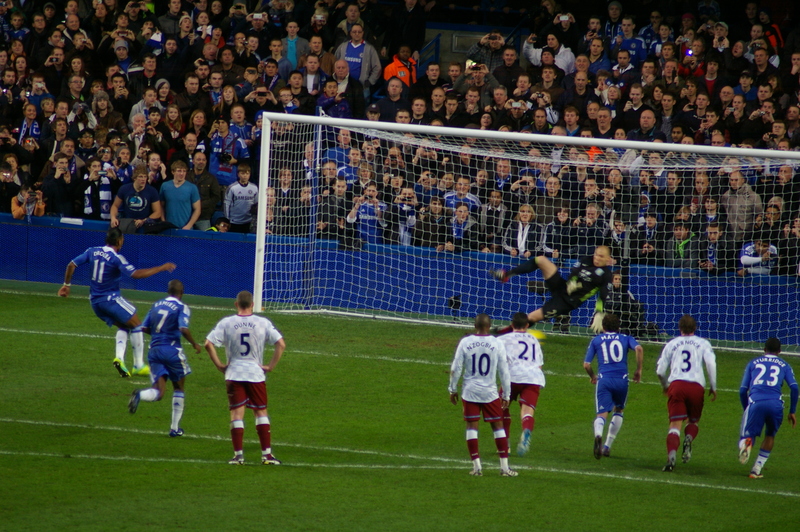 Chelsea vs. Aston Villa : 31 December 2011. A day of poor performances on and off the pitch and a day of quiet contemplation as one year drew to a close, with another one ready to start. I was back in the hot seat once again. I love driving, to be honest, so it’s never a chore. I pride myself in not knowing anything about cars – I don’t get turned on by engine capacities, turbo systems or leather interiors – but I love driving as a means to travel and as an activity in itself. I love the buzz of driving, the allure of new cities, observing new architecture, and I relish the joy of seeing magnificent countryside as I hurtle past. Combining driving with football is an added perk for me. Of course, if a new ground is involved, even better. I especially enjoyed driving up to Burnley two seasons ago on a bitterly cold day and heading into alien territory. It was one of my very special personal memories from that momentous closing period of The Double season. We have away games at Norwich City and Swansea on the horizon and I am already looking forward to those two; a shame they come within ten days of each other. What is the expression about eggs being kept in the same basket? Parky had unfortunately missed out on tickets for the away game at Norwich when they went on sale this week, though. The club had stupidly decided not to use loyalty points to decide who gets the chance to apply for this prime ticket and Parky missed out during the mad scramble. It is my view that the right to purchase tickets for the away games at the three newly promoted teams should always be on loyalty points; this invariably results in the “new ground” scenario. Look how crazy it was for Blackpool away last year; the hottest ticket for an away game for years. Likewise, QPR in October. Tickets went on sale for that game with no loyalty point system in place. Yet another example how out of touch the club is with regards to their rank and file support. High profile away games really are a mad scramble. For the Norwich City game, Chelsea receives 2,389 tickets. The 550 folks in the away season ticket scheme (of which my friends Alan, Gary and Andy, along with myself, are members) are assured tickets. The remaining 1,839 get split 60-40 amongst season ticket holders (1,103) and members (736). So, around 25,000 season ticket holders got the chance to apply online for just 1,103 tickets with no loyalty weighting in place and is it any wonder that Parky missed out? Parky and I had a new travelling companion for the game with Villa. Young Jake – he will be known as Young Jake in these chronicles as he is only 23 – is a friend of Parky’s son-in-law Kris and he goes to a few home games each year. We first met him in The Goose at the start of this season. He would be taking Glenn’s season ticket alongside me for this game so I had arranged to collect him in Trowbridge at 9am. A few minutes later, Parky was on board, too. This would be my 48th Chelsea game within the calendar year of 2011. My highest ever total was 57 in 2009. I can’t see that ever getting beaten to be honest. I briefly looked back on the year. After the euphoria of 2010 (a stunning year for Chelsea, but also a deeply enjoyable one for myself on a personal level), is it any wonder that 2011 has not lived up to expectations? When one considers that the year of 2011 involved three losses at Old Trafford within seven months and three home defeats by Liverpool, it never was going to be a classic Chelsea year. My favourite personal moments of the past twelve months are easy; beating United 2-1 in the league, a great week of the Royal Wedding and victories over West Ham United (the Torres goal still makes the hairs on the back of my neck stand to attention) and Tottenham Hotspur at either end of it, the amazing games in Kuala Lumpur and Bangkok, the noise and passion of the defeat of Manchester City a few weeks ago and – the highlight – meeting my old friend Mario for the Leverkusen away game in November. Actually – think about it. What fan of Lincoln City, Leicester City or Leeds United would not want to experience what I did in 2011? We drove in via the M25 and then the A40 again. Jake usually travels up to London by train and so this was a little treat for him. I usually get a little frisson of excitement as I ascend the elevated section of the M4 on my approach to Chelsea, but this other approach is not without merit. In addition to driver, I acted as a tour guide to Jake as I pointed a few sights on our quick journey into London. We passed the art deco magnificence of the Hoover Building and we then caught a quick glimpse of The Shard away on the horizon, amongst the skyscrapers of The City. The Shard will soon become the tallest building in Europe and is designed by Renzo Piano. This architect was first brought to my attention when he oversaw the transformation of the old Lingotto Fiat factory in Turin; the one with the test track on the roof as featured in “The Italian Job” and where my friend Tullio’s grandfather worked. With that, we treated Jake to a gravelly rendition of the series’ theme tune. We zipped through Earls Court and I explained how the area’s moniker of “Kangaroo Valley” got its name and then we sped past Brompton Cemetery; the final resting place of the club’s founder Gus Mears. I pointed out the roof supports to the Matthew Harding to Jake as we neared the end of our 136 mile pilgrimage. I thought back to my childhood; seeing the embankment of the old North Stand as the District Line train came out of the tunnel was always a tantalising moment for me on my childhood forays to Stamford Bridge. I got the feeling that Jake was getting those same feelings. At the Yadana Café we breakfasted like kings. Bacon, egg, sausage, mushrooms, tomatoes, baked beans, fried bread, black pudding, toast and coffee. Young Jake’s pre-match prediction was of a 3-1 Chelsea win and he repeated this forecast at regular intervals throughout the day. Jake and Parky popped into The Goose and I flew down to The Bridge. I wanted to take a quick look at what was on sale in the shop. I just bought one item – the book “Chelsea Uncut” – and that was quite enough for me. I rarely spend my hard-earned on club merchandise, though I did see a few reasonable T-shirts on sale, including one which said something about the club being founded in The Rising Sun; nice, a bit different. The place was packed, though. It was too crowded to be enjoyable, though. I only stayed about ten minutes. I popped up to the hotel foyer, had a quick word with Mick and bought a pint of lager. I noticed that none other than Kerry Dixon appeared with a few guests. Kerry was a big hero for me during his time at the club and I have been very lucky to spend a few hours in his company on two events in the West of England. These were undoubtedly two of the best nights ever. On the second occasion, a friend of a friend took us on to a country pub in his small Vauxhall Corsa. Being wedged in the back seat of a small car next to Kerry Dixon as the driver navigated the narrow country lanes around Farrington Gurney is one of my most surreal memories as a Chelsea fan. I waited to catch his eye and offered my hand. He wished me a Happy New Year and we both uttered the phrase “always a pleasure” at the same time. Always embarrassing that, isn’t it? The same words. D’oh. I sat myself down and had a flick through the book that I had just bought and I loved it. There can’t be many Chelsea photographs from our ancient history that I am yet to see, but the book contained several. I especially enjoyed the old black and white photographs from the early years. A favourite photograph is of a Chelsea goalkeeper – almost certainly Vic Woodley – pumping the heavy leather ball up field on a cold and misty afternoon, with the terraces out of view. There’s a superb snap of Pat Nevin, the dribbler supreme, crouched and about to spin away from a Newcastle defender from “that” game in November 1983. There is the iconic photo of the substituted Johnny B patiently waiting in the tunnel during the closing moments of the Leeds game later that season. Photographs of Matt Damon, Raquel Welsh, Tiger Woods, Lana Turner, Kobe Bryant , the New York Giants and the Chicago White Sox. At the bottom of the escalators, I spotted Gill and Graeme and waited for few minutes for the players to walk through. I then battled the crowds of match day tourists on my scramble out of Stamford Bridge and back up to the pub. I made my way to the bar and glanced up at the TV screen to see that Blackburn Rovers were winning at Old Trafford. Just one more pint, but plenty of chat with the usual suspects. I welcomed the two Texans Wes and Jeff back to Chelsea; Wes now resides in Southfields, but Jeff was on a flying visit. He was last over two years ago and we spent a few moments dissecting the recent performances of the team. We agreed that – altogether now – this is a season of transition. If we have to down before we go up, so be it. I chatted to Andy about the away games at Swansea and Norwich. Andy had decided that he wouldn’t be travelling down on the Tuesday evening for the Swans game, so he sold his ticket to Parky. To complete Parky’s good fortune, Daryl sold him his ticket for the game at Norwich. Parky had a beaming smile after these two transactions. Andy and I had the briefest of chats about Rangers – he is more a fan than I – and we ended up chatting about the Rangers legend Davie Cooper. I spoke about a goal I saw him score against Celtic in around 1979 in the pre-season Drybrough Cup. I promised to send him a YouTube link if I could find it. It is one of my favourite goals of all time. The inevitable fight back by United was met with typical groans, but we then exploded when Rovers miraculously went ahead. Young Jake and I walked down to the ground and we overheard that, indeed, United had been beaten. I quickly texted my Blackburn mate Mark. What a lovely moment for the lad; welcome back, Sam. Villa had brought down around 800 fans from Birmingham and they didn’t waste too many moments in asking us if we had won a European Cup. Elsewhere, there were empty seats, but the crowd was larger than the Fulham game. Villa last won in the league at Stamford Bridge in May 2002 and I didn’t expect them to provide a massive threat to us. We enjoyed the early possession but shots from Daniel Sturridge (high) and Didier Drogba (wide) didn’t threaten the Villa goal. Villa had a few chances, mainly involving Agbonlahor on the break. 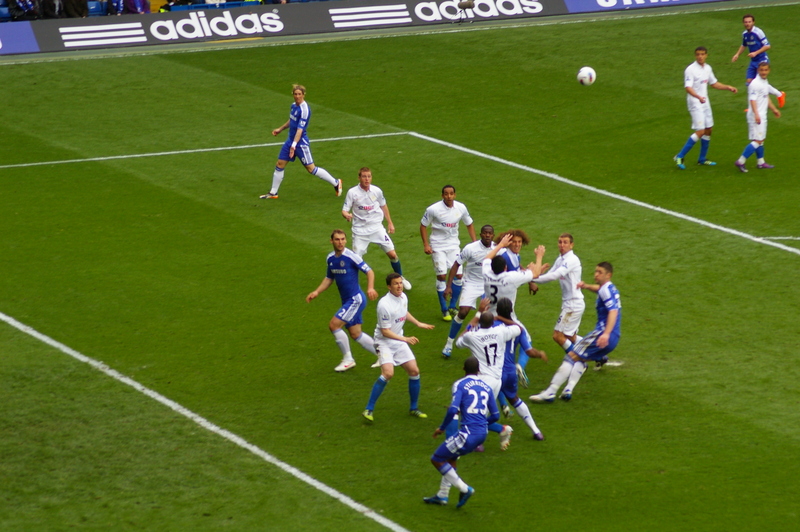 The move which lead to the foul on Drogba was the best passage of play in the game to that point. Drogba seemed to have a verbal spat with Mata over who would take the penalty; there was only going to be one winner, there, with Didi just one goal away from Roy Bentley and Peter Osgood on 150 Chelsea goals. It wasn’t a clean strike but he scored and I captured it in film. Roy Bentley, Peter Osgood, Didier Drogba – 150. However, five minutes later Villa equalised with a poorly-defended and scrappy goal from Stephen Ireland. In a poor first-half, our only other chances involved a half-chance from Mata and two free-kicks from Drogba, who clearly fancied himself as the star of the show. Ramires had been surprisingly quiet, but Luiz was steady at the back. Our play was so slow, though, and we didn’t take advantage of the occasions when the play opened up due to Villa’s frequent breaks. At the half-time whistle, there were audible boos. Soon into the second-half, a lovely run from Juan Mata down below me was exhilarating to observe at such close quarter. I really do have a great seat at Chelsea and Jake was loving it too; his first ever time in the Matthew Harding. On this occasion, Drogba’s run was too soon and the ball rolled away behind him. A Villa free-kick came close, and we had been warned. A Chelsea move broke down and a rapid break from the visitors found the pacey Agbonlahor. We expected the worst, but his weak shot was easily saved by Peter Cech and the covering Luiz averted further danger. Frank came on for Oriel Romeu and we hoped for the best. How odd it must be for Frank, now, to be limited to rare starting appearances. From that game in 2002, only John and Frank remain. How frustrating for him and for us to watch on as his prolific career undergoes a heart-breaking decline. Daniel Sturridge was having a very poor game – shirking his defensive responsibilities and rarely threatening up field. He was replaced by Fernando Torres and virtually his first touch almost resulted in a goal. He moved the ball onto his right foot, shaped nicely, then unleashed a cracker which dipped wickedly and slammed against the bar. I know I am biased, but how damn unlucky has Torres been during his Chelsea career? He should be on 15 goals, not 5. If only that first chance in the first-half against Liverpool in February had gone in. If. The biggest word in football. The promising Albrighton bamboozled Ashley Cole but Cech saved. A lovely move involving Frank and Fernando set up Drogba, but a week shot ended up well wide and didn’t bother Guzan in the away goal. By now, the natives were restless and the support – hardly ever rising to more than a muffled groan – was now being even more derisive. Chances were as rare as an Arsenal trophy parade. Well, what do I know? He sent in a wickedly dipping blast which the ‘keeper palmed over. This optimistic effort from distance proved to be our last real scoring chance. In a cataclysmic final ten minutes, we conceded not one but two goals, both from typical Villa breaks. Just after two penalty claims were waved away, Agbonlahor raced through a massive gap in our rear guard to slot cleanly past Cech. I’m proud of them for that. At the final whistle, half the crowd had departed and a few hundred around me booed. I’m not proud of them for that. As Jake and I walked miserably down to street level, there was a horrible tone amongst the supporters, accusing various players of lack of effort. I hate to hear these words, but I had to agree that our fight was missing throughout the game. In football, you have to fight for the right to play. Once in possession, you have to move and support the man with the ball. There was little evidence of that too. A solemn day in SW6. However, I suddenly remembered Jake’s 3-1 prediction and playfully took a swipe at him. It was a pretty reasonable journey home – time wise – but it wasn’t the easiest of drives to make. The usual self-inspection after defeat is never easy is it? A double espresso at Reading put bounce in my step, though, and the music emanating from Parky’s 80’s CD cheered us. On the closing moments, we spoke with Jake about his love of the team and also of his past games and we were, at last, able to put things into perspective. His Dad was a Chelsea fan and took Jake to his first game in the autumn of 1998 for a game against ‘Boro. Sadly – and neither Parky nor I knew this – his father passed away three years ago and Jake said that, poignantly, he feels closer to his father at Stamford Bridge than anywhere else. Through a shared sense of belonging amongst friends, at the stadium where his father spent many an afternoon no doubt, Jake felt better placed to cope with what life could throw at him. Just before we hit 2012, I quickly scanned the internet for that Davie Cooper goal. While Scotland was celebrating the alcohol-fest that is Hogmanay, I watched open-mouthed as the great Rangers left-footer continuously juggled the ball against Celtic at Hampden Park in 1979. Cooper was a “tanner ball” player in the mold of our own Scottish dribblers Charlie Cooke and Pat Nevin and I just couldn’t resist playing and re-playing that amazing clip time after time. A trip to Molyneux awaits. Let’s hope that 2012 starts in decidedly better health than which 2011 ended.